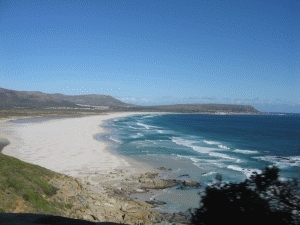 The Cape Town beaches are without any doubt among the top beaches of the world. The rare combination of the stunning mountain scenery and a turquoise blue ocean in a mediterranean climate is something very special. Check out my family's favorite beaches and I am sure you will enjoy the amazing beauty of these Cape Town beaches and make these beaches your favorites too. The scenery is so breathtakingly beautiful with the white sandy half moon beach, the famous Camps Bay Beach boulevard which is lined with palm trees and the Twelve Apostles mountain range as a backdrop. Real holiday feeling. 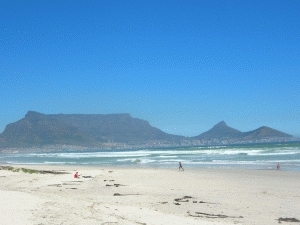 And it is an award winning beach as it is one of Cape Town's Blue Flag Award Beaches. Street vendors sell arts and crafts and occasionally students or musicians will entertain the tourists as well as the local Capetonians. This is the one of the Cape Town beaches where you go when you want to see the rich and famous, the young and beautiful and want to be seen. Once you have worked long enough on your tan in this beautiful half-moon cove you can go on relaxing in one of the many sidewalk cafes and restaurants. This is definitely the place to watch people. At Camps Bay Beach you can rent deck chairs and umbrellas and you will be offered icecream, drinks and African crafts by the beach vendors. There are always people to be seen enjoying the cold Atlantic waters, which seldom top 17 degrees in summer. But after a sunbath or a game of beach volleyball this might seem very refreshing. Parking is available at the streetside and in the parking garage adjoining the Camps Bay Hotel. Noordhoek Beach is one of the most beautiful beaches on this planet and definitely goes on top of my list of the best Cape Town beaches . The beach already lures to its wide white sandy lagoon when you are coming down the Chapman’s Peak Drive. From there you will be mesmerized by the long and white stretch of pure white sand and the waves of the deep turquoise blue Atlantic rolling in. At the northern end close to the rocks you can watch surfers catching a wave or stroll up the dunes to the Monkey Valley Resort. From the rustic restaurant bar you have magnificent views across the long beach. The beach is an amazing 7 km long and the temporary lagoons offer the opportunity to splash your feet in warm waters. If you walk along the beach in southward direction you will come to the wreck of the SS Kakapa and maybe you are lucky like me and you see a whale jumping in the sea. There are some security concerns as muggings and worse crimes are happening at this very quiet beach. So I would stay away from that lovely place, but at weekends there are many people and you will feel safe here. Parking is available coming from the Monkey Valley turn off from the Chapman's Peak Drive. This stretch is very popular as there are almost everywhere houses nearby and the beaches are considered as safe. But nevertheless I never would walk alone along any unpopulated beach. Either walk with a friend or take a dog. Find more pictures and info on Blouberg Beach here. Here you can walk for miles and miles. The beach is quite wide at low tide and you will enjoy the superb views towards Table Mountain going southwards from Blouberg to Milnerton. There are several restaurants and bistros at either Milnerton beach on Woodbridge Island or, this is my favorite spot in this area, you can rest a little at the fabulous sushi-bar and restaurant at "Blowfish" in the Dolphin Beach Hotel or further on in one of the many eateries in Blouberg. If you like you could even continue on through Bloubergsands to the Big Bay Beach with its rocky coves and boulders from where you will enjoy the splendid views towards Table Mountain in the far distance. Just remember even if this coastal walk is superb in any weather, the wind will be blowing here most of the days. Sunbathing is when the Cape Doctor is blowing only possible if you find a sheltered spot along the dunes of these beaches. Here you will find more info on which Cape Town beach in which wind you should choose: The best windfree beaches in Cape Town and the best surfers beaches. 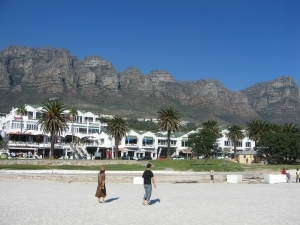 There is plenty of parking along the beach in Blouberg, Sunset Beach and on Woodbridge Island. So these are three of my family’s favorite Capetown beaches. And there are still so many more, like Boulders Beach , where you can swim in the lagoon with the little African Penguins. So watch this space. More secrets about the best Cape Town beaches are still to come. If you want to share some details about your favorite CapeTown beach site please let me know .